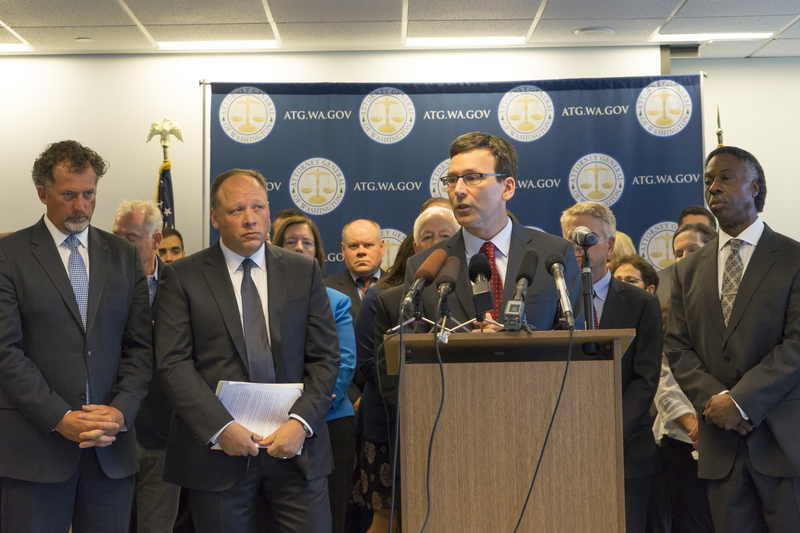 OLYMPIA — Attorney General Bob Ferguson, joined by a broad coalition of over 50 community leaders and elected officials, today announced he will submit agency request legislation in the 2017 session to ban assault weapons and high-capacity magazines. The bill would ban weapons like the AR-15 used to kill three teens and wound another at a party in Mukilteo in July. Reports indicate that the shooter used a 30-round magazine in that incident, which would also be banned under Ferguson’s proposal. A limit on magazine capacity — currently unlimited under Washington law — to a maximum of 10 rounds of ammunition. Sen. David Frockt (D-46) and Sen. Kevin Ranker (D-40) are working with Ferguson to craft the legislation. The proposal will be modeled after successful assault weapon laws in other states, such as New York and Connecticut. The courts have determined these states’ bans to be constitutional. Unlike the bans in some other states, Ferguson’s proposal targets only sales, grandfathering current gun ownership. The legislation would not require registration of existing weapons. On July 30, three more young people were killed when a troubled 19-year-old opened fire on a party in Mukilteo — reportedly using an AR-15, a military-style semiautomatic weapon that would be restricted under Ferguson’s proposal. This legislation will save lives. A review of mass shootings between January 2009 and January 2013 by Mayors Against Illegal Guns found that incidents where assault weapons or large capacity ammunition magazines were used resulted in 135% more people shot and 57% more killed, compared to other mass shootings. When a gunman terrorized Seattle Pacific University with a double-barreled shotgun in 2014, student John Meis heroically tackled and disarmed the gunman while he was reloading. Even more Washingtonians might have been shot if this weapon held more rounds and had the assault-style features of the alleged Mukilteo shooter’s weapon. A recent poll presented by Washington Ceasefire and Ceasefire Oregon showed that 65 percent of adults in the two states — including a great many gun owners — favor an assault weapons ban and want lawmakers to act. Attorney General Ferguson will file this legislation in December.